GarageBand has always used color coding to indicate what types of regions its tracks contain. Green regions are software instrument regions containing MIDI data. Blue regions are real instrument regions containing audio from Apple Loops. Purple regions are real instrument regions containing audio that you've recorded. The spectacular GarageBand 2 introduced a new color to the region rainbow: orange. When you import an audio file into a GarageBand project, it's displayed as an orange region. GarageBand 2 introduced the ability to shift the tempo and pitch of regions that you record. But this capability doesn't extend to regions that you import. When you record a region, GarageBand "stamps" it with your project's tempo and key information, but imported regions lack this data. Thus, you can�t shift the tempo of orange audio regions, nor can you transpose them. At least not without a little trickery. If you know your song�s tempo and key match those of the orange region (or if you don�t care -- maybe you just want to slow down a solo to figure it out), here�s the secret: select the orange region, press Control-Option-G, and then click elsewhere in the timeline. GarageBand stamps the region with your project's key and tempo settings and turns the orange region into a purple one. Now you can transpose it and stretch its tempo. This is great for doing remixes of tracks from your iTunes library. Incidentally, if you open a project created in GarageBand 1.x, its once-purple regions will be orange. Use the Control-Option-G trick to convert them, too. Tip: To calculate a song�s tempo, check out iTunes-BPM Inspector. Heard about the new GarageBand instructional DVD? The one with 44 musical minutes of GarageBand tutorials, plus a library of loops? Actually, it's the DVD that comes with The Macintosh iLife '05, the latest edition of my complete iLife reference. 345 full-color pages and a two-hour, 43-minute companion DVD. It's shipping on April 8, and Amazon is selling it for $23.09 -- 34 percent of the cover price: music to any Mac lover's ears. Pre-order yours! Last week, I signed off on the final proofs of The Macintosh iLife '05. And then I immediately got the flu. Three months of 18-hour days -- writing by day, editing the book's companion DVD by night -- finally caught up with me. I wonder why I didn't succumb earlier in the process. Adrenaline, maybe. The timing was amazing. 1:15 am: sign-off on proofs. 7:00 am: awaken with a mushroom cloud in my throat. I've been flat on my back since then, and my cozy bed beckons even now. But I had to drag my wheezing frame in front of the Cinema Display to cough out the good news. Here's the best part: my book and its companion instructional DVD will be off-press and shipping in less than two weeks. Peachpit Press pulled out all the stops to cut the book's press time to an absolute minimum. A few vital statistics on the new edition: 345 pages, up from 271 in the iLife '04 edition. (And these are packed pages: because of the book's 8.5-inch wide page size and our use of the extremely space-efficient Helvetica Condensed font, there's far more text on each page than in most other books. This book's pages work for a living.) The book is being printed on a silky smooth, 70-pound coated paper stock. And of course, the entire book is in color. You'll soon be seeing The Macintosh iLife '05 in a special display at Barnes & Noble stores across the United States. Can't wait? Pre-order the book from Amazon.com. The cover price has gone up $5 from last year's edition -- it's now $34.95 -- but Amazon is still offering a hefty 34-percent discount. That makes the latest edition of the top-selling iLife book $23.09. Enough of the me-commerce. I'll be updating the rest of this site in the next couple of weeks to include some excerpts from the book and the new DVD. Now, though, my Robitussin is calling me. Forrest Corbett is bummed. Over at Macintouch, he complains that "On my PowerBook G4 500, a slideshow of 150 800x600 images takes nearly an hour to export. In iPhoto 3, it only took a few minutes." Setting aside the fact that there was no iPhoto 3, we can help Forrest through the trees. The problem deals with the exact same topic I addressed a while ago: the two different flavors of iPhoto slide show. When you want to create fancy -- cinematic, Apple calls it -- slide show, use the Slideshow button at the bottom of the iPhoto window. But note that exporting this kind of slide show takes more time, since your Mac must render a lot of video frames. When you want to create and export a basic slide show -- with no custom Ken Burns moves and with the same transition and duration between each shots -- don't use the Slideshow button. Instead, simply toss your photos into an album, then saunter up to the Share menu and choose Export. This lets you export the photos using the techniques that earlier iPhoto versions provided. Forrest goes on: "Setting the slideshow to be the same length as the music, sometimes results in one photo being drawn out for a matter of minutes while the rest are just a few seconds." That's a bug. In iPhoto 5.0.1, the "fit slideshow to music" option doesn't work. It's that simple. Hopefully we'll see an update that addresses this. That fresh-baked book smell. It ships to the printer next week: the newest, biggest edition of the original digital hub book and its companion instructional DVD (now over 2.5 hours, with 45 minutes on iPhoto 5 alone). And Amazon is still offering a whopping 34 percent discount. Pre-order The Macintosh iLife '05 for $21. Got vinyl? I do, and as soon as I ship my book to the printer (soon! real soon! ), I'm going to resume digitizing those bad boys. This morning, I stumbled on a site that may serve as a great reference: The Vinyl Word, a column that runs on SoundStage!, a site for high-end audio lunatics -- er, buffs. The latest installment of The Vinyl Word features a review of a $2500 turntable that's more beautiful than any CD player could ever be. 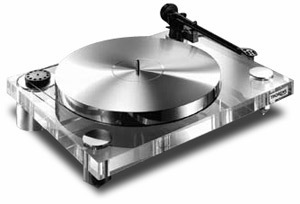 The Thorens TD 2010 features a nine-pound -- nine pounds! -- turntable platter, among its many other magnificent attributes. On tonight's edition of Point & Click Radio, the weekly radio show that I co-host here in Mendocino County, CA, I'll be interviewing Jeff Keller, founder and editor of Digital Camera Resource Page, one of the most popular digital photography sites on the Web. We'll be talking about the latest cameras and trends in digital photography. When Apple announced its AirPort Express base station last year, this site was the first to point out a limitation: the base station's AirTunes feature worked only with iTunes -- you couldn't wirelessly stream audio from other programs, such as QuickTime Player or RealPlayer, to the base station. Leave it to Rogue Amoeba Software to fix that. Today, the company shipped Airfoil, a $25 utility ($20 through March) that hijacks audio from any program and transmits it to an AirPort Express base station. My use of the term hijack was deliberate. Rogue Amoeba (a hard pair of words to type early in the morning, I might add) is the company behind the Audio Hijack family of programs, which let you record the audio from any Mac program on your hard drive. The company has taken its audio-hijacking prowess and applied it to AirPort Express. I've been using Airfoil (which was called Slipstream while in development) for a while now, and I've found it a painless and reliable way to pipe audio from other programs to my stereo system. My wife listens to NPR archives on the stereo. I blast radio stations that insist on using Windows Media streaming. Airfoil doesn't care; it just works. Finally, click Airfoil's Transmit button and start your audio playing. Airfoil's window even indicates whether your AirPort Express base station is connected to your stereo through an analog or optical-digital connection. Becaus AirPort Express must buffer the audio stream, there's a delay of a second or two until you hear the audio. That makes hijacking movie or DVD audio problematic: the sound and picture will be out of sync. The Airfoil on-line help has workarounds that involve using alternative movie players that let you adjust sound/picture sync. Who cares? 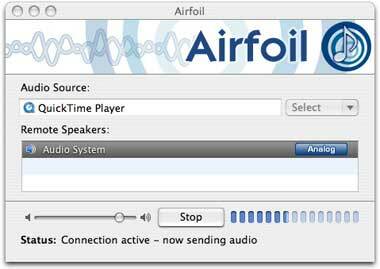 For me, Airfoil is all about transmitting streaming Internet audio. And that's all there is to it. Rogue Amoeba has again filled an important niche, and filled it elegantly. Of course it's in the book. You'll find coverage of Airfoil, AirPort Express, and so much more in the next edition of the original Mac digital hub book. Amazon is still offering an insane 34 percent discount on The Macintosh iLife '05, which goes to press in just a couple of weeks. Almost 400 full-color pages and a 2.5+ hour instructional DVD -- for a little over twenty bucks. Pre-order your copy now.